Plant a piece of history! Appreciated and cultivated since ancient times, pomegranates are a true link to the past. 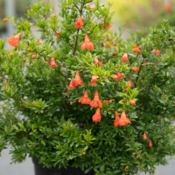 Peppy Le Pom™ pomegranate is a new take on the classic, with a cute little dwarf habit that not only greatly expands how it can be used in the garden - it also expands where it can be grown, as its petite size is perfect for growing in a pot in colder climates. Just bring it indoors when the temperatures dip to continue to enjoy the show. Peppy Le Pom spends summer covered in the orangest blooms you've ever seen, each dangling from the stems like an ornament. 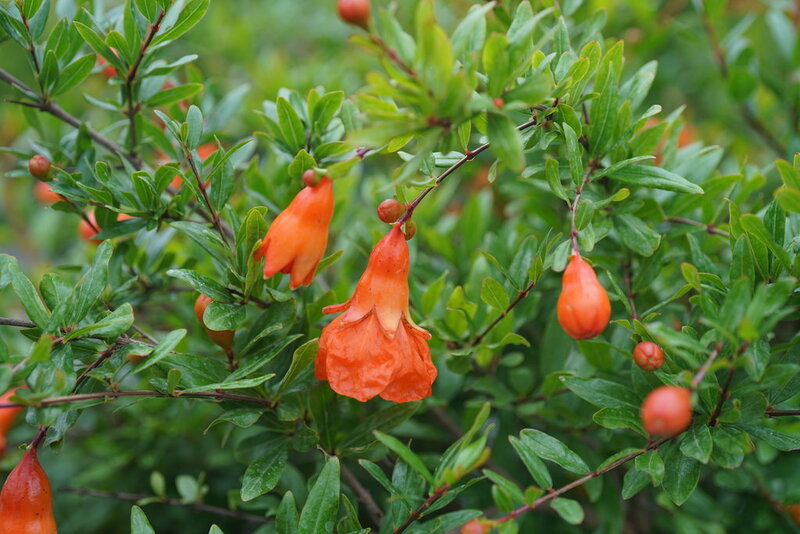 These develop into tiny little pomegranate fruits, which, while technically edible, have only a few small, sour seeds inside, so they're really best appreciated on the plant. 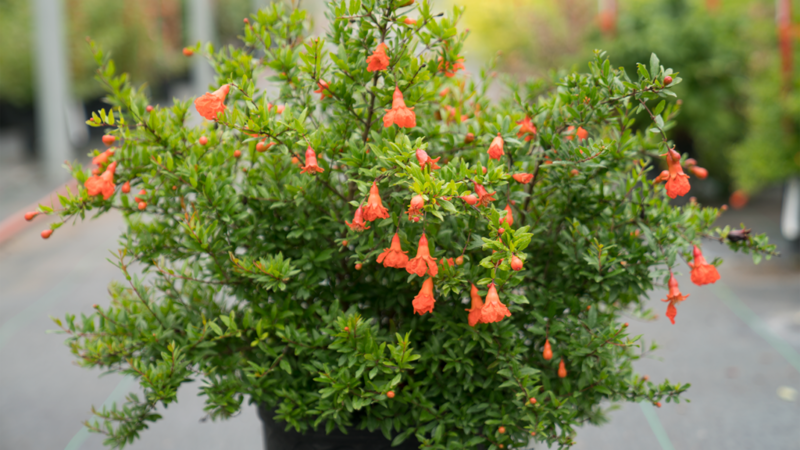 Peppy Le Pom™ pomegranate is the work of award-winning plant breeder, Megan Mathey. - Dwarf habit gives it new ways to be used in the landscape in warmer climates and allows it to be grown as a patio and indoor plant in cold areas. 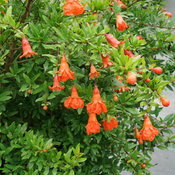 - Vivacious orange blooms and plenty of them, all summer long. 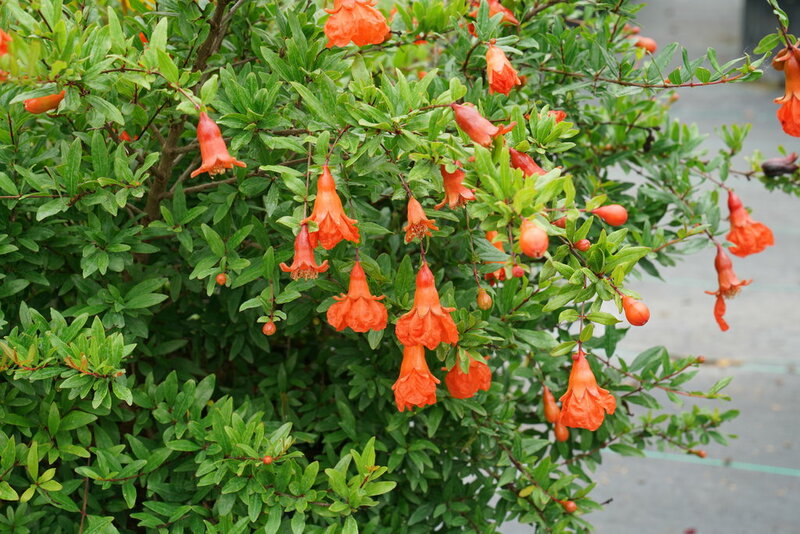 - Though it does't need to be pruned regularly, it can readily be shaped into small topiary shapes. 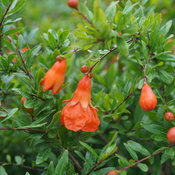 This dwarf pomegranate reaches just about a quarter the size of conventional varieties, so can be incorporated into herb and flower gardens, or used in landscapes as a unique edging. Peppy Le Pom can be left to grow as a dwarf oval kind of shape, or shaped into topiaries. Trim as needed, with any major pruning taking place in spring. Avoid cutting into any thick stems unless you are removing them entirely, as recovery from such cuts is slow. If you live in a cold climate and want to grow Peppy Le Pom pomegranate in a pot outdoors for the summer, you can bring it indoors for the winter. Keep it in a cool but very bright spot all winter, out of the path of blasts of heat from radiators or air ducts, as well as blasts of cold air from exterior doors. Cut back on water compared to summer, but do not let it dry out. Don't panic if the plant drops some foliage making the transition from outdoors to in - that's normal, and they plant will replace them when conditions improve come spring.